View cart “The Tin Forest” has been added to your cart. “My Activity Pack-Word Building” helps children in letter recognition, improve spelling and build everyday vocabulary with the help of beautifully illustrated pictures of objects relating to their immediate environment. 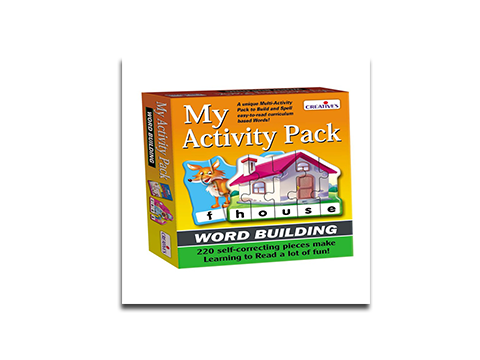 The pack includes 60 sets of 3 to 5 piece ‘Word Building’ puzzles, two ‘Activity Books’ and an ‘Activity Guide’. Children begin by building 3 letter words, gradually moving towards 4 & 5 letter words. The Activity Books include various activities such as fill-in-the-blanks, matching activities, crossword puzzles etc. to reinforce and practice word building skills. Similarly, the ‘Activity Guide’ includes useful teaching suggestions and directions of group games.